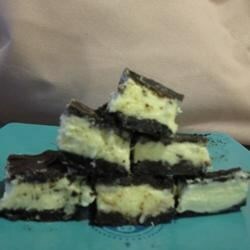 "No-bake, with three layers of yumminess: a somewhat chewy cookie bottom, vanilla frosting middle, and chocolate top layer. Everyone loves these." Line a 9x9-inch square pan with parchment paper. Place 1/2 cup of butter into the top half of a double boiler, and melt over simmering water. Stir in the sugar and cocoa powder until the mixture is smooth and the sugar has dissolved. Whisk in the beaten egg and gently cook, whisking constantly, until the mixture thickens up, about 1 minute. Remove the double boiler top from the heat, and stir in the cookie crumbs until very well mixed. Press the crust into the prepared dish, and refrigerate until chilled, at least 30 minutes. In a mixing bowl, beat together 1/2 cup of butter with the vanilla pudding powder and cream with an electric mixer until the mixture is fluffy. Slowly beat in the confectioners' sugar, and continue beating until the mixture is very creamy and pale yellow, about 2 minutes. Spread the filling over the crust, and return to the refrigerator for at least 30 more minutes. Was given this recipe over 30 years ago by a friend in Vancouver,BC..Glad to see it here, these are so very rich! Thanks for sharing! !